There are substantial savings to be had if you purchase your tickets in advance. 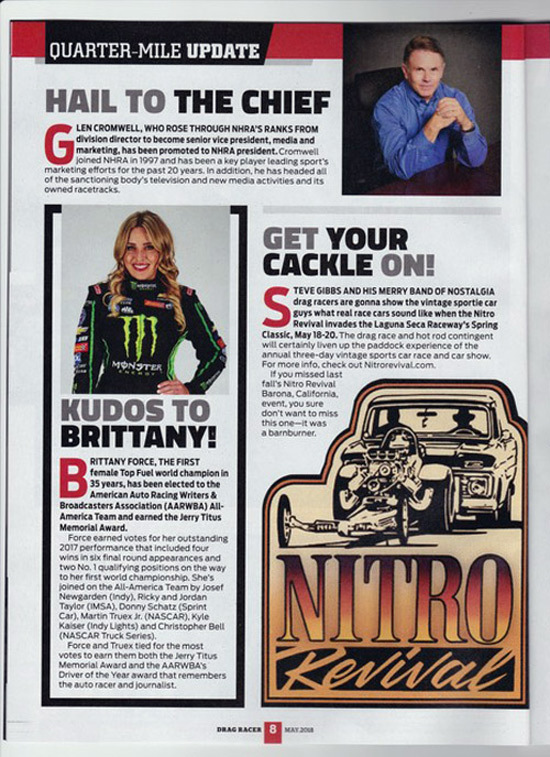 SALINAS, Calif.  Mike Dunn, who for 14 seasons provided the color commentary for NHRA tour events covered by the ESPN networks, returns to the mic May 19 as the guest commentator for the Nitro Revival portion of the annual Spring Classic vintage car race at WeatherTech Raceway at Laguna Seca. 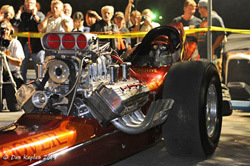 The 61-year-old son of drag racing Hall of Famer Big Jim Dunn was a standout mechanic and driver before being selected by ESPN as one of the anchors for its NHRA telecasts in 2002. When the NHRA switched networks in 2016, FOX declined to pick up his contract, leaving Dunn free to pursue other projects. With Gary Scelzi, Kenny Bernstein and Don the Snake Prudhomme, the Pennsylvania resident owns the distinction of having won double-digit NHRA tour events in both the Top Fuel and Funny Car divisions. Dunns first professional job in the sport was as a crewman for Roland Leong on the Hawaiian Funny Car he later would drive himself. He won 10 times in the Funny Car division for Leong and the legendary Joe Pisano. He then won 12 tour events in Top Fuel driving for car owners Jack Clark and Darrell Gwynn and crew chiefs including Ken Veney and Frank Bradley. The Nitro Revival at Laguna Seca will showcase restored versions of many of the cars with which the sport was identified in the 1960s and 1970s, including cars sponsored by Champion Speed Shop which was operated by the late Jim McLennan, an inductee into the Bay Area Sportswriters Hall of Fame, the NHRA Hall of Fame and the International Drag Racing Hall of Fame. The Jim McLennan foundation, now operated by his son Bob, will sponsor the Welcome Center for special guests at the Nitro Revival including members of the International Drag Racing Hall of Fame. 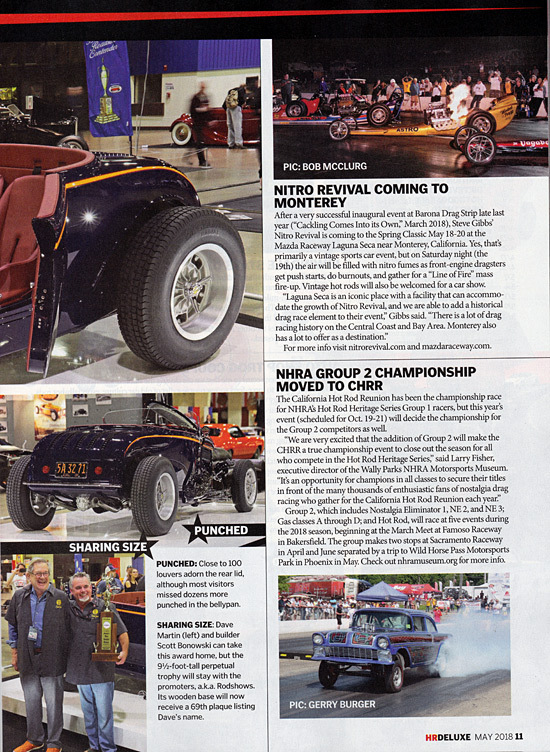 The Nitro Revival serves as a reunion for racers and as an exciting step back in time for those unfamiliar with drag racings California roots. Highlight of the one-day event will be the Line of Fire, a simultaneous cackle of all the assembled nostalgia cars. 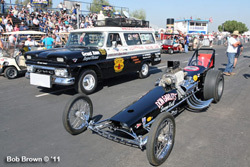 SALINAS, Calif.  The Jim McLennan Drag Racing Foundation, whose namesake was a mainstay of Northern California motorsports for more than four decades, will sponsor the Nitro Revival Welcome Center on Saturday, May 19, during the drag racing portion of the annual Spring Classic vintage car race at Weather Tech Raceway at Laguna Seca. The Hospitality Center will be open to special guests including members of the International Drag Racing Hall of Fame. It also will be the site of autograph-signing sessions featuring Big Daddy Don Garlits, Ed the Ace McCulloch, Jerry the King Ruth, Kelly Brown, Marvin Graham, Frank Bradley, Richard Tharp, TV Tommy Ivo, Gary Beck, Tom Hoover, Herm Petersen and Gentleman Joe Schubeck, among others. Coming Friday, May 18, 2018 on the famed Cannery Row in Monterey. 3:00  7:30: Two top fuel dragsters plus Aces 34 Victoria on display at front of hotel (fire up time has not been determined). The cars are the incredibly beautiful Tom Hoover "Fish Bowl" car owned by Steve Anderson and the historic Don Garlits "Swamp Rat III" owned by Sonny Mesner. 5:30  6:30: Autograph session with the attending IDRHoF members at the Intercontinental Hotel. Then at 6:45 p.m. the "guest speakers" move to the courtyard area of the hotel for a Q&A session. Join Don Garlits, Ed McCulloch, Tom Hoover, Jerry Ruth, Tommy Ivo, Gary Beck, Marvin Graham, Herm Petersen and more. Mike Dunn to be emcee.